Blogger Danielle Carolan, shown above, proves that you can’t go wrong working some white sneaks into a casual-chic “airport look.” Of course, this style can be rocked all year long—whether you’re traveling or not—just by switching up from a tank or tee to a cozy knit sweater. Plus a chunky white sneaker takes the outfit a step further and adds some trend to your travel. This look worn by style Influencer Danielle Bernstein, shown above, is one of my absolute favorites because it’s the most unexpected. It mixes feminine and sporty in a way that used to be out of my comfort zone, but is now one of my go-to combos. 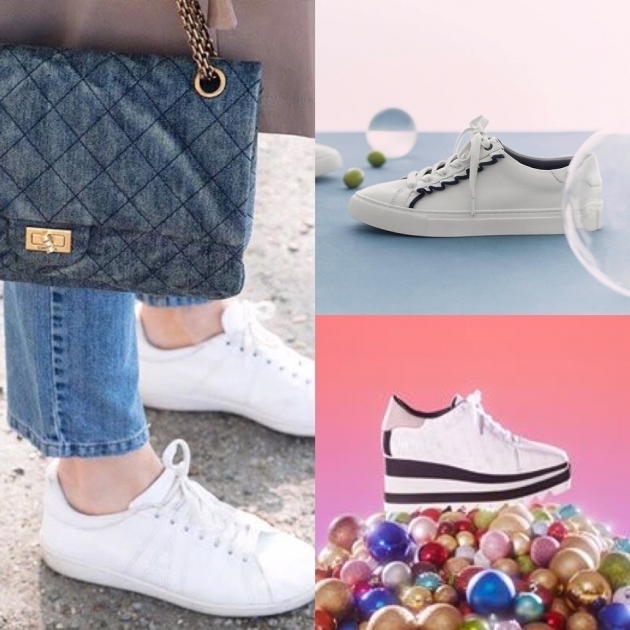 The pairing of florals and ruffles with an athletic sneaker looks so effortless yet pretty and fresh thanks to the crisp, clean look of the all-white shoe, which doesn’t fight with the dainty look of the dress. All you would have to do is add another layer to take the outfit from one season to another. During New York Fashion Week last September, I saw white sneakers paired with tailored suits, blazers, dresses and other classic work looks for a “sporty girl” meets “girl boss” style, worn by style Influencer Audree Kate, above. This is a professional look I experiment with all of the time. If you’re looking for a super chic business look, pair your white sneaks with a plaid or colored trouser to contrast the blazer and you’ll feel like you can conquer anything.